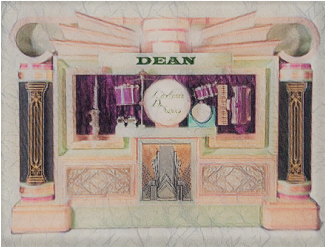 For more than 45 years the family run business of Dean Organ Builders have been manufacturing new mechanical organs, for both private and commercial customers. We are one of the most experienced English mechanical organ builders, with an enviable reputation for quality and reliability in operation. With our vast knowledge of manufacturing new fairground and street organs together with the experience gained over the years of maintaining various historic manufacturers dance organs and orchestrions, we can offer a bespoke service to create a dance organ or indoor orchestrion to suit your requirements and budget. We can supply anything from: a small wood cabinet house organ / café orchestrions, to a large carved fronted pipe dance organ based on historical design. If you prefer we can also produce a dance organ using pipes and also playing an electronic organ, a style popular during the 1960s and 1970s era. From a veneered wood cabinet three rank organ suitable for use in a private home, up to very large multi rank models, with many automatic registers and percussion effects for larger buildings or commercial venues. Organs can be supplied playing on traditional book music or on a modern midi system. 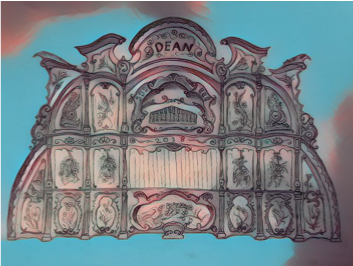 When you buy a new Dean organ you will benefit from our experience in tailoring a design to suit your requirements. All of our own manufactured organs are constructed 'in house' here at our Whitchurch workshop using the finest quality materials and English craftsmanship. We are able to supply a repertoire of traditional and modern music to suit your taste on book or midi, giving your new instrument a personalised library for all occasions. Not only should a new organ give excellent musical performance, but it should also be attractive to the eye. 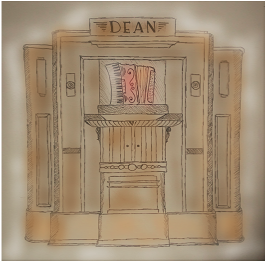 At Dean Organ Builders we offer a design service with a wide choice of styles for the façade of your new organ. This can be seen from just a few of our concept pictures on this page. From the vibrant coloured post 1930 traditional to the pastel coloured classical period of the turn of the century or perhaps a veneered cabinet design typical of those built for stately homes, the choice will be yours. You are really only limited by your imagination and budget. As with any artists we just need your patronage to create something wonderful for future generations to enjoy. The new organ of today is the collectable of the future. Click Here For The Fair Organ Page. Carved Wood, Moulded Or Cabinet Type. A huge choice of pipe work configurations and percussion effects are available on most new organs - Bourdon Celeste, Violins, Piccolos, Trumpets, Saxophone, Trombones, Flute, Jazz flute, Vibratone, Tremulant, Glockenspiel, Xylophone, Woodblocks, Drums, Cymbals etc. etc. It is not only the look of the façade that is important, but also the cabinet / case in which the organ is housed. This cabinet / case needs to be aesthetically pleasing on the eye, we can offer a veneered cabinet, staining and graining, polished wood, painted or stained finish the choice will be yours. Why not contact us today to discuss the commission of a new dance organ or orchestrion.